Neli Vazquez ’14 addresses the senior class in the Druckenmiller Atrium at the kick-off event for the Senior Class Gift Campaign, which about a third of the grade attended. The campaign works to raise donations from the Class of 2014 for a gift to the College, in the form of a scholarship for a student in the incoming Class of 2018. 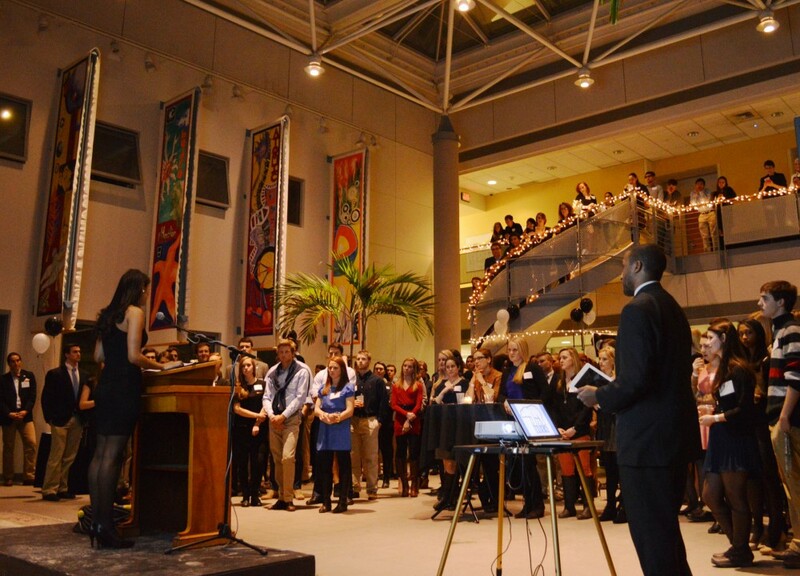 Last night, over 160 members of the Bowdoin Class of 2014 convened in Druckenmiller Hall to support the annual Senior Class Gift Campaign. The event is a classy affair—complete with hors d’oeuvres, champagne and semi-formal attire—geared toward raising donations from the senior class for a gift to the College that will aid future students in the years to come. This year, the campaign is spearheaded by seniors Filipe Camarotti, Emily McNeil, Neli Vazquez and Wiley Spears. The four directors were selected through an application and interview process in the fall and hired in early October by Alumni Fund Associate Alain Mathieu. In addition, there are 32 senior class agents who volunteer to help run the campaign and educate the rest of the class about its objectives. Modeled after last year’s project, this year’s class gift will be a scholarship to a future member of the Class of 2018, a gesture that many students see as a great way to give back to the College. She also stressed to potential donors that it is really the thought that counts, and that students giving smaller donations to the fund should not see their contribution as insignificant. The ultimate goal is an 85 percent class participation rate, a feat that would surpass last year’s class by five percent and seems entirely possible considering the large student turnout. Students also commented on the event as a good way to bring the class together in a relaxed and fun setting. “The class doesn’t get to see each other enough, so it’s great that we can all come together in this environment,” added Marie Centano ’14. This year also marks the first time that members of the faculty and staff have been invited to participate in the event. “It’s really great that Security can be involved in something like this,” said Campus Security Officer Allen Daniels, one of many Bowdoin employees present in Druckenmiller Thursday evening. The campaign does not end with 2014 either; the Class of 2014 Gift Campaign operates with the hope that class members will continue to give to the College after receiving their diplomas. President Barry Mills was unable to attend Thursday’s event, but instead appeared onscreen before an idyllic faux snowscape background to encourage students to donate. “Once people start to give to the College, it becomes something that becomes part of their life,” he said. At Bowdoin, there are two kinds of people: varsity athletes, and everyone else. Colloquially, this second group is commonly referred to as “NARPs:” Non-Athletic Regular Persons. But contrary to the NAS report’s conclusions, this divide—if it exists—is not an academic one; the differences in athlete and non-athlete GPAs is negligible, according to an April 2013 Orient article. This is how Ben Smith, Coach of the 1998 U.S. women’s hockey team, described the team’s Canadian rivals in an interview with the New York Times leading up to their Olympic matchup. It’s fair to guess that some Bowdoin hockey players may spend tonight similarly fixated on an opponent from the North, though the rival in question is Colby, not Canada. Today the Polar Bears will defend the first of last year’s decisive victories over the Mules. The rivalry between the two teams is a classic grudge match, and this year’s games continue a long and storied tradition. Last week, the Orient circulated an anonymous survey to students investigating health and eating at Bowdoin. Of the 538 respondents, 61 percent were female and 39 percent were male. Eighty-four percent of students said that they felt Bowdoin created a healthy eating environment, while 55 percent of female students reported that they think they need to lose weight, and 45 percent of female students were worried about a friend’s eating habits. Six percent of students reported that they had been diagnosed with an eating disorder. According to Director of Health Services Sandra Hayes, issues of disordered eating are more complicated than a black-and-white diagnosis. When President Obama cold-called Richard Blanco and asked him to be the 2013 inaugural poet, he gave the poet three weeks to write three potential poems. Working from his home in Bethel, Maine, Blanco said he circled and circled until he landed on the first line of “One Today,” the poem he read to over one million people at Obama’s inauguration last January in Washington, D.C.
Blanco visited campus last Friday, October 25, headlining Family Weekend with a day that included a student poetry workshop, public book signing, and an evening reading that filled the seats of Pickard Theater. His visit was funded by the Office of Student Life, Office of Multicultural Student Programs, the Resource Center for Sexual and Gender Diversity, and the Latin American Studies Program.